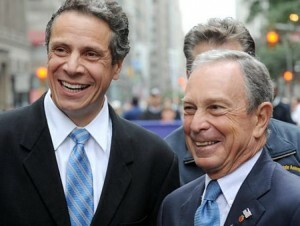 Pictured here with fellow anti-liberty activist and New York Mayor Michael Bloomberg is New York’s Democrat governor Andrew Cuomo. As Democrats across the country en-masse abandon their promises to constituents that “we won’t take your guns, ” the 2016 presidential hopeful is looking to be a champion of the gun control movement. Cuomo already governs a state with some of the most restrictive gun laws in the country but in the wake of the tragedy in Newtown, he hopes to strip citizens of even more rights. According to news reports the package he hopes to pass includes a ban on semi-auto rifles and shotguns and severe limits on normal magazine capacity. Culturally, New York has not been part of American mainstream for years but this move will take them even further away from the ideals on which this nation was founded. Read more at CBS New York. This entry was posted in Abuse of Power, Anti-Gun Democrats, Assault Weapons Ban, Gun Control, New York, Proposed Gun Control. Bookmark the permalink.